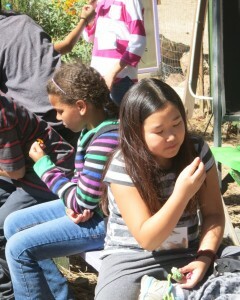 Often, students enjoy our surplus produce in the form of mid-class snacks! 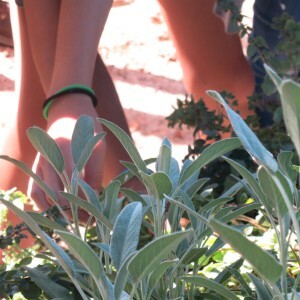 It’s the middle of spring, and that can only mean one thing… Permaculture is in the air. What is permaculture? Well, it’s a philosophy, it’s a style of gardening, it’s classes we teach here at the ranch, and it’s super easy to understand and practice! Permaculture starts with three basic principles: care for people, care for the Earth, and return the surplus. Caring for people is as easy as feeding folks good food. Using water appropriately is one example of caring for the Earth. And return the surplus? Do birds ever eat out of your garden? Do you have a compost pile? These are both excellent ways to return the surplus. It’s also important to recognize the work done by some of our non-human friends. That pesky gopher is aerating and loosening the soil making it easier for new roots to grow later. Here at the ranch we’ve paid our gophers with at least one Swiss chard, two beets, and a spinach plant (but it was on its way out). That Peter Cottontail who keeps visiting your carrots also helps fertilize for next season. Those annoying insects that buzz around our heads pollinate crops like zucchini and pumpkins. Everybody likes a healthy garden, especially naturalists and their students! The Pathfinder garden features an herb spiral from which students can taste new flavors and Nauralists can spice up their meals! So you may be wondering, “How can I put these ideas to use?” Where do we start!? Support local farms who practice permaculture principles. Start a garden bed for veggies or native flowers. The Monarch butterfly looooooves milkweed; so check your local native plant nursery. If you have the space, you can start a compost pile for your food scraps and napkins. If you already have a compost pile and you use it for you own garden, you can encourage others in your community to do the same. Then you’ll have someone to trade veggies with. Even if you only have a small space, gardening will help you “take care of people”, by growing your own cooking herbs on your windowsill or maybe a potato tower on your porch. Here’s one more link on how to grow some of your own vegetables in containers. Spring’s halfway through, but for us here in sunny southern California we still have a long growing season ahead. Happy planting from everyone here at Pathfinder Ranch.